From time to time I overhear or read about people discussing whether obesity should be considered an Eating Disorder (ED). I have even seen obesity listed along with anorexia and bulimia as if it were just common knowledge that it belonged there. This is just wrong on so many levels that it almost seems like it is not worth acknowledging the discussion. On the other hand, it is so often promulgated both in the lay media and in scientific circles that perhaps it is important to elucidate the ways in which the classification of obesity as an ED makes no sense. Extreme expressions of a range of weight and food issues…serious emotional problems that can have life threatening consequences. Obesity, on the other hand, is defined as a Body Mass Index (BMI) equal to or greater than 30. It is a measure of height and weight (kg/m2). Just as there are different eating disorders, there are other measures of height and weight; The Ponderal Index, The Body Mass Prime and The Body Volume Index to name a few. An ED is a serious emotional problem/illness and obesity is a measure of height and weight. So, on the most basic level comparing obesity and eating disorders is somewhat like comparing apples and oranges. Actually, the comparison is really a good deal more obtuse than that because apples and oranges are at least both fruits. 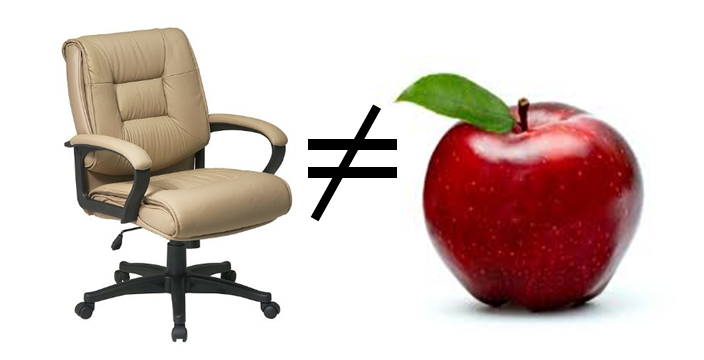 The comparison between obesity and eating disorders is really more akin to comparing an apple with a chair. You can’t sit in an apple and you can’t eat a chair! Actually, on a somewhat lighter note, I have seen a chair shaped like an apple, but you still can’t eat it. It is important to remember (as I discussed in a previous blog post) that this BMI measure (1) was never meant to be a measure of health and (2) is a population statistic not meant to be used on individuals. So, making connections between this measure of obesity and the serious emotional health issue of EDs is scientifically unjustified and inappropriate. On the next most basic level, it is certainly true that body weight and eating disorders both have something to do with food. Yet, the evidence that people labeled as obese eat more than other people is inconclusive at best, with some recent research even suggesting that just the opposite may be the case. So, the very common suggestion that you can know whether someone is eating the “proper amount” of food (or the “right kind” of food for that matter) by looking at them is not supported by the evidence and therefore, doing so can best be defined as prejudice (pre-judging). Of course, the lack of supportive evidence for this conclusion does not stop people from continually making it. In fact, the word obesity itself comes from the Latin obesus, whose primary definition, “one who has become plump through eating,” confirms the misconception. Instructively but perhaps not surprisingly, the secondary definition for obesity usually includes the words coarse and vulgar. From a phenotypical perspective, the concept of obesity as an ED also makes no sense. Most patients with anorexia nervosa and bulimia nervosa have always been thin and “normal weight” people. However, everyone knows that the vast majority of people in these weight categories do not have an ED. With the acknowledgement of Binge Eating Disorder (BED), many therapists are now seeing fat people who have an eating disorder. As is true with people of any size, of course, the vast majority of fat people also do not have BED. Research suggests that somewhere between 4% and 8% of people labeled as obese may suffer from BED which means that the overwhelming majority, 92% to 96%, do not! The only thing anyone can diagnose by looking at a fat person is their own level of prejudice toward fat people.